If you work with either Zack or me you are likely going to get Baked Perfection cupcakes for your birthday. Of course you are more likely to get some if you work with me, but a several of Zack's co-workers have been lucky enough to get cupcakes too. I made these cupcakes for Zack's friend and co-worker Brian for his birthday. They were a couple weeks late because his birthday fell in the middle of busy season (fellow auditors know what I am talking about). Anyhow, Brian told Zack his favorite flavors which were strawberry, blueberry, and brownies. I wanted to make cupcakes and was not in a chocolate mood, so brownies were out. I decided to go with strawberry because what is more manly than pink cupcakes? Just kidding, I decided to go with strawberry because that is what I was in the mood for. I will be the first to tell you that these cupcakes were delicious. My friend Ellen who has tried a ton of my cupcakes said these were her favorite and her opinion matters. I made a filling for these cupcakes with frozen strawberries packed in syrup, but have since made a blackberry and raspberry filling using frozen whole berries that I let thaw sprinkled in a couple tablespoons of sugar and used the juice it extracted while thawing. If you don't want to make a filling you can use a high quality strawberry jam and it will be just as good and nobody will need to know it was not homemade. To fill the cupcakes I used the large end up a piping tip to cut out a round section in the cupcake. I then fill the cupcake and put the cut out portion of the cupcake back over the filling. Feel free to use a knife to cut out a section to fill. In a medium bowl combine the flour, baking soda,baking powder and salt. In a separate mixing bowl, cream the butter and sugar. Beat in the eggs, one at a time. Add the vanilla; mix well. Add the flour mixture to creamed mixture alternately with sour cream (batter will be thick). Fill greased or paper-lined muffin cups with 1/4 cup of batter. Bake at 350 degrees F for 25-30 minutes or until a toothpick inserted near the center comes out clean. 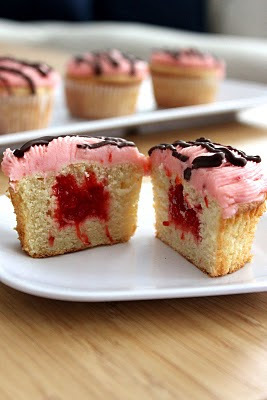 Cool completely and fill with strawberry filling. 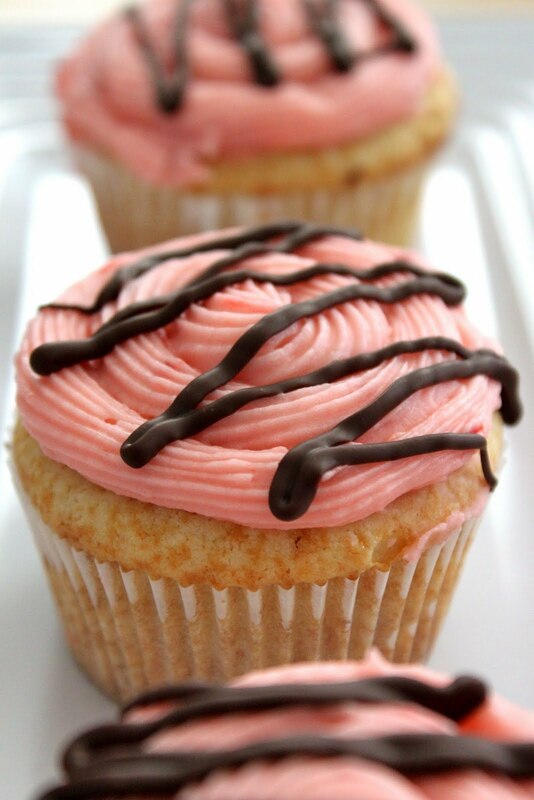 Top with Strawberry buttercream. Recipe makes approximately 30 cupcakes. Beat butter and vanilla until creamy. Mix in strawberry filling and salt. Add powdered sugar 1 cup at a time, beating until combined. Add milk 1 tablespoon at a time until you reach desired consistency. These are my go to cupcakes!!!! Found them a few years back and make them for just about everything. As a matter of fact I am making some tonight for teacher appreciation week! Awesome recipe thank you so much! Just made these. I made a strawberry filling from scratch, instead of using the strawberries in syrup. I didn't get any complaints, but no compliments either. The cupcakes were disappointing to me. They tasted more like cornbread than a cupcake, not sure why, but I'll be looking for a different vanilla cupcake recipe next time.